Smoked Mozzarella Sticks take your ordinary Mozzarella stick to the next level. There is a very exciting recipe challenge that is kicks off Monday June 9th and closes Thursday, June 19th. I made a recipe highly inspired by Fried Mozzarella Balls by Cooking Planit. 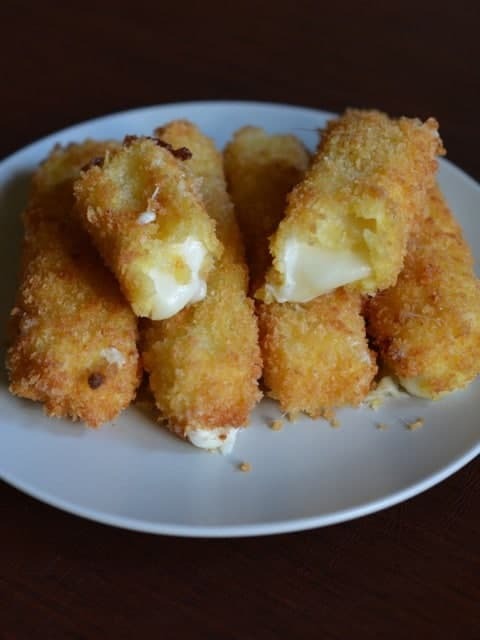 I had some wonderful smoked Mozzarella cheese from Formaggio and thought it would make fried Mozzarella sticks. If you haven’t tried Cooking Planit software before I highly recommend this app, it is available for both iPhone and Android devices. If you are just learning how to cook this is the perfect app for you, it will help you schedule cooking several dishes at once so your meal is ready at one time. It will help you prepare a grocery list, it will email you when you should get started to put a meal on the table at a particular time, and so much more. I loved the ease of Cooking Planet’s take on the Fried Mozzarella Balls on their website. I had a party to go to this weekend, and I wanted to make something unique. I personally love fried cheese sticks, I don’t think it gets much better than a deliciously fried cheese stick. Formaggio sells a smoked Mozzarella cheese that is nothing short of incredible. I loved the way the Cooking Planet put the Mozzarella cheese stick with Panko breadcrumbs. If you use smoked Mozzarella you have a unique flavor. Add enough vegetable oil to fill a pot about three inches deep. If you use a smaller pot, you will need less oil. Heat oil until 350 degrees. Cut Mozzarella into large sticks, about 2 inches by 3/4 to 1 inch. If your cheese is rounded you will need to trip off the rounded edges, you can place these trimmings into a salad. I like to use thicker sticks for this. Set up a breading station consisting of 1 bowl of milk, one bowl of seasoned flour, and one bowl of Panko Bread Crumbs. In a small bowl add flour, black pepper, and garlic salt. Stir to combine seasoned flour. Dip sticks into milk, then seasoned flour, coating well. Shake off excess. Place the cheese stick on a rack. Allow cheese stick to rest about 5 minutes before dipping into the milk again, and then dip into Panko breadcrumbs. Coat well. Allow cheese stick to rest for a few minutes before cooking. This time of resting helps the coating glue onto the food. Fry cheese stick in hot oil. Fry until just golden brown. Remove from hot oil and drain on a wire rack. Serve immediately. Sometimes panko breadcrumbs aren't very uniform coming out of the package. You can place your panko crumbs into a plastic bag and gently roll a rolling pin over them to make them more uniform. The Panko crumbs will coat the cheese better this way. i have made cheese sticks before, but these were great.